In my opinion, you can't go wrong when you're combining flavors in a fruit pie. Clearly, you could do all raspberry or all strawberry or all peach, but isn't it more interesting to have all three? This pie originally started out as a raspberry peach pie, simply because Trish loves Peach Melba. Then I realized I didn't have enough fruit to fill the pie, so I added strawberries to it. The result was delicious! Actually, come to think of it, blueberries would've been a nice addition too. Like I said, you really can't go wrong! What fruit flavors would YOU like to try? Line a deep dish pie plate with one pie crust, making sure to let it hang over the edges about an inch. Set aside. Set raspberries aside. In a mixing bowl, place peaches, strawberries, sugar, flour, cinnamon, salt, extract, and lemon juice. Using a rubber spatula, gently toss ingredients together. Pour peach-strawberry mixture into prepared pie plate. Top with raspberries. Cut butter into small pieces and place over top of fruit. Place second pie crust on top. Fold top crust under lower crust to form a ridge. Flute to make a decorative edge. Cut slits in top to allow steam to escape. Bake for 15 minutes. Reduce heat to 350 degrees F. Bake 30-35 minutes more or until crust is golden. Cool on rack. I usually don't stir the raspberries in with the strawberries and peaches because all too often, they wind up getting mangled because they're so fragile. Just add them separately, either first or last or a little at a time as you add the rest of the fruit. Use as much or as little cinnamon as you like. I usually just get the container of ground cinnamon and do a few shakes across the bowl just before I toss everything together. If your fruit is extra juicy, your pie might bubble up and over. (As you can see in the picture above). To save yourself from having a burnt mess on the bottom of your oven, simply put a baking tray or a few sheets of aluminium foil on the oven rack just below your pie. Instead of just cutting slits in your top crust, try weaving the top crust into a lattice as shown in my video How to Make a Lattice Top. 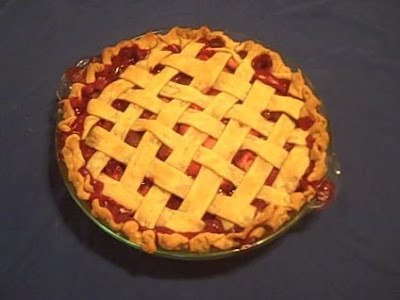 By the way, this is the pie that Paul and I used in the video. I only mention it because I've received several emails from people wondering what kind of pie that was. loved this! I only had peaches and blueberries but it was delicious all the same. Can't wait to try it with the strawberries and raspberries!